Yesterday during the homily at Daily Mass, Father said something that really made sense. I don't remember word-for-word what he said, but it went something like this: Being a Christian doesn't mean our lives are perfect. It means having the faith we need to get through whatever adversities come our way. That really hit home. It seems like at the height of Lent, when I felt my faith getting stronger, our family went through something that tore my heart apart. I can't imagine how much worse it would've been if I didn't have my faith to fall on during that time. 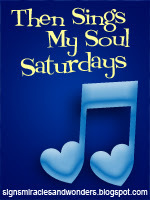 Please visit Amy at Signs, Miracles, and Wonders to see what songs have touched people this week. I don't know how those without Christ make it. Great song... thank you for sharing it! Coolest video! Beautiful song! Love Dave Crowder! Thank you for sharing! Thank you for sharing with us Mary! Have a wonderful weekend! I too don't know how those without Christ get through. I hear ya. I've been going through something pretty difficult in the last week and prayer and the faith I have in the one I'm praying for are all that really matters! DCB is one of my favorite bands ever. So sad they are going there separate ways after this year. : ( Their music has helped carry me thru some stuff! Hope everything is okay now...take care! Great song, and I hope the situation with your family has improved. Sometimes stuff HAPPENS, but you're right - your faith will help you through. What a blessing. I love how we have the same readings, but get totally different homilies. Some people imistakenly think that believing in Christ earns them a one-way ticket on Easy Street. But you only need to look at the Blessed Mother to know that is not so. Thanks for sharing. Love the song, too, BTW.